Stores reference 6A/1002. Black painted aluminium alloy metal case. Approximately 6cm diameter. Self starting keyless 1-day movement with centre second hand. The clock is wound by rotating the bezel and hands set by pressing a spring loaded lever projecting from the lower right corner whilst rotating the bezel (knob missing on this example but hands can still be moved). Black dial with white Arabic numerals. The dial is part luminous and is marked with reference numbers and 1942 date. The case is a little paint chipped but undamaged. Good dial, hands and glass. Complete with 'dummy' hands for setting the 'time of trip'. The backplate is A.M. (Air Ministry) marked. In good working order, running and keeping time for approximately 18 hours. 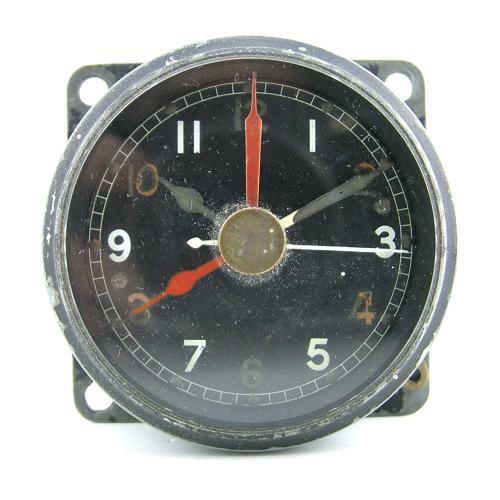 This type of clock was used in some models of Ansons, Battles, Beaufighters, some Spitfires, Beauforts, Sunderlands, Austers, Lancasters and Mosquitos. A good example. Stock code C22352.